Our company has a wonderful experience in mobile app development for Android. If you want to find app developers for hire, you need to look for the company, which provides professional teams of application developers, who can join your project for cooperative building of apps for smartphones. Mobile app development for Android is very demanded nowadays due to the fact, that there are ~1.4 billion devices with Android OS as Google announced in 2015. The most popular apps include social networks, games, photo and video enhancers, lifestyle apps, and the ones, that help you organize your tasks. Lives of many people are too busy to keep all the things they’ve planned for the day in their heads. This explains the need of task management applications, that certainly can provide users with possibility to organize their to do lists in a smarter way. 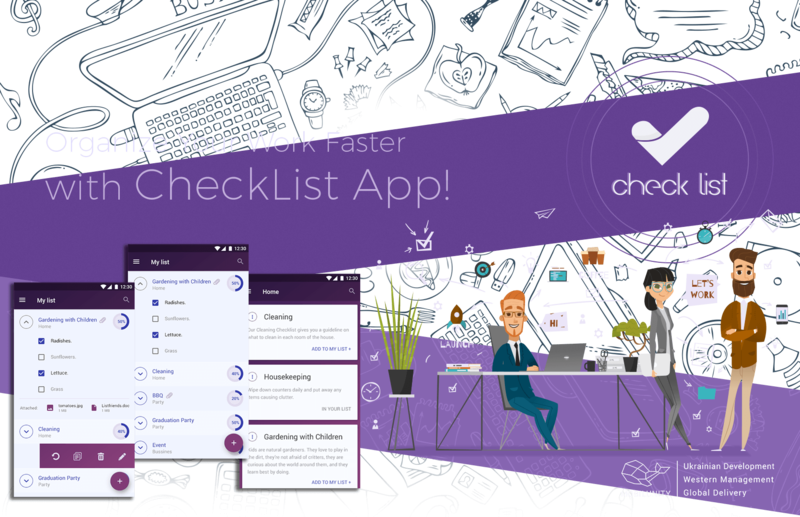 One of our successful examples to introduce – is a free to do list app, called CheckList. It is targeted on making your life easier, because there will be no need in writing long shopping lists on the paper, and of course no more forgetting those papers at home. This kind of apps is not only popular, because it’s convenient for a personal use, but also because it’s great for planning a project or multiple tasks, that several departments of a company may share. That is why lots of companies want to hire android app developer, in order to create a mobile app of their own and use it in-house as well as allow users on the internet to download it. Being professionals of their kind, developers of Mobilunity are flexible to work with different projects of a variety of businesses and integrate all the latest technologies to create a mobile app, that is worth attention of many users worldwide. Thanks to our dedicated team of developers, we have near 700 visits per month on the page with our app in Play Store, and near 150 installs for month. Our users are from multiple countries and near 60% of them have the latest versions of Android on their smartphones. We are glad, that every following month our stats are showing better numbers, which are 53% higher from the previous one. Now we can surely say, that our remote mobile developers are capable of creating not only high-quality products, but useful and demanded ones too. Many companies challenge the lack of employees for their big projects, especially it concerns remote mobile developers. We provide app developers for hire, who can fill the gap in the niche and help companies to implement their ideas into the ready solutions. Our dedicated team of developers is ready to perform the tasks for your company and create a successful mobile app for you. Hire dedicated developers in your team to build an Android app together!